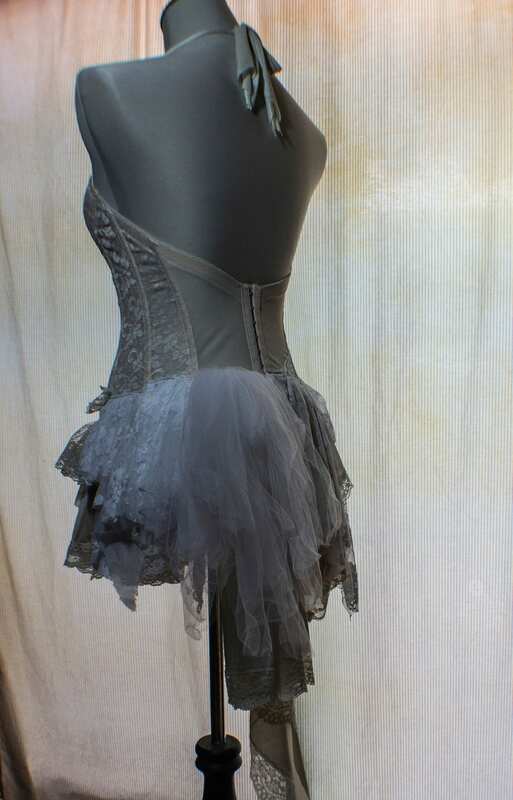 For the playful ballerina rag doll. 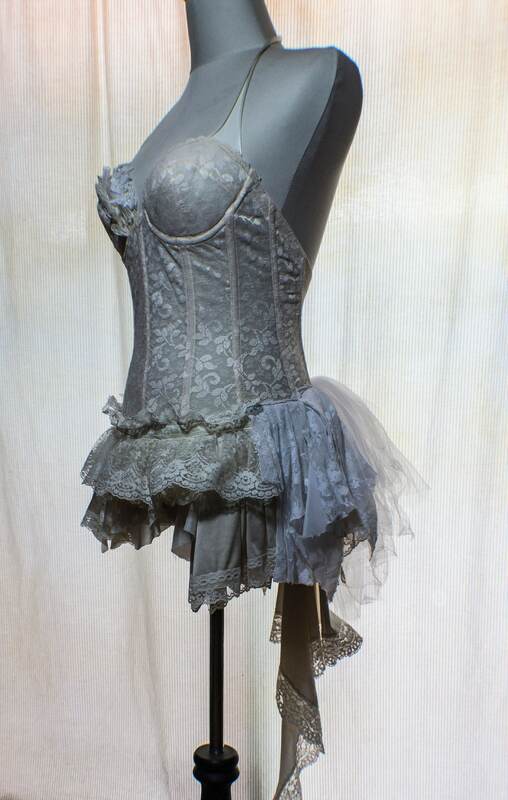 This would be a great top for any performance, event, or night on the town. This is made mainly from vintage slips. A few curtains, some really amazing lace, and other bits of goodness. 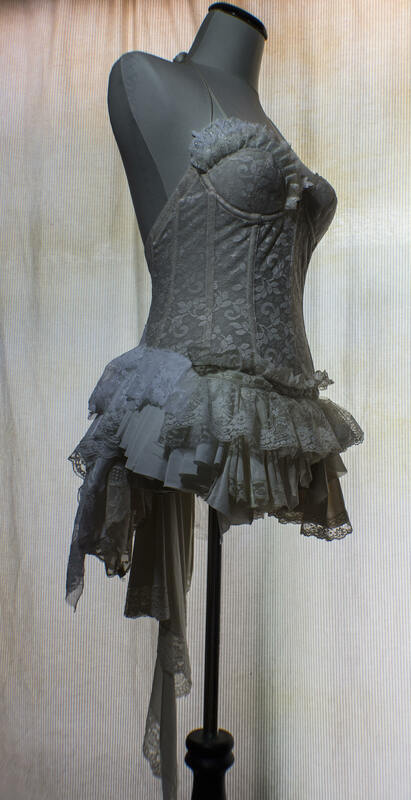 All of the detail work is hand sewn and features decorative Frankenstein stitching all over and lace detail. If you would like more information about this garment, please contact me and I would be happy to answer any questions. Policies Payment Paypal is my preferred payment method. You can use a credit card with Paypal, or an echeck, or link it with your bank account. You do not need an account to use Paypal, but signing up for one is super easy. I also accept credit cards directly through Etsy. My shop also accepts Etsy gift cards. If you choose other as a payment option, or if you are adding customization's to your order please let me know via message before you pay for your items. For additions I must post a custom listing for you including the extra charges. Coupons are not applicable to custom orders, unless we have previously discussed a discount. For higher priced items I would be willing to set up a payment plan with you, We can talk about a time frame for payments and shipment dates. -* Although I do accept payments I will only start assembling custom garments after I have received a payment. Half of the design must be paid for before I can start sewing your garment. Please keep this in mind for expected delivery date. Policies Shipping Normal processing time is 1 to 3 business days. Unless otherwise specified in the listing, or e-mail. I ship USPS parcel post, or First Class If you would prefer a different shipping method please convo me with your preferences and I will try to accommodate you. Please let me know if you require a tracking number. Priority Mail, Fed Ex, UPS and Other shipping methods tend to be more expensive so we might have to adjust the shipping rates. I will never overcharge, if I over estimated you will be credited the difference of shipment. Anything over $65 dollars automatically gets upgraded to Priority mail. Any order over $200 goes out Priority mail, and will be insured. I also insure very delicate items for the best interests of both of us, if an insured item gets lost in the mail I will try to replace the item, with a similar item at no extra cost to you. For international mail I can only offer standard global parcel post. Hopefully this will change in the near future but due to the price of international shipping this snail mail standard might be the best shipping option available without breaking the bank. Policies Refunds Most of my pieces are one of a kind, and or can be considered as costumes or formal wear. Because I make every effort to describe products accurately and due to the nature of such garments and given the handmade design aspect I cannot accept liability for slight variations in the actual product you receive. I will ask you for important information pertaining to the size, color and materials of your order. If after that you are unhappy I will attempt to solve the problem in one of the following ways. If you are unhappy with the fit of your garment and you need an alteration please convo me and I will try to resolve the problem for you. You must pay for the shipping to return it to me, I will do the alterations and then ship it back to you First class, or parcel post, with no extra charges. If you need the item altered by a certain date you will have to pay for a shipping upgrade. -* All custom order payments must be received before delivery of the finished design. Full or Partial payments will not be refunded if I have already started creating your design, due to the nature of custom orders, it may be impossible for me to re-sell your specific custom item. If an item is the wrong quantity, or does not match the item description, please contact me and I will organize a refund or exchange on receipt of the product you were sent. *This does NOT apply to any 'made to measure' custom items which cannot be returned or refunded. They have been especially made for you. If you do not like an item upon arrival please let me know immediately. I will work to resolve the problem. Let me know BEFORE you send the item back. Tell me about the problem within 7 days after receiving it. Item must be sent back within 7 days. Please note that if you are returning an item, I am not liable for any package that is lost or damaged in the post. The original postage will not be refunded and the customer will be responsible for the delivery cost for returning the item. In the case of goods returned for refund, payments will be refunded within 30 days of our receiving the merchandise in acceptable condition.